Shenzhen, China – Magnusson Klemencic Associates (MKA) is thrilled to announce that Salesforce Tower has been named the Council on Tall Buildings and Urban Habitat’s (CTBUH’s) award winner for Best Tall Building Worldwide! This distinguished honor was presented at the 2019 Tall + Urban Innovation Conference held on April 8-10 in Shenzhen, China. 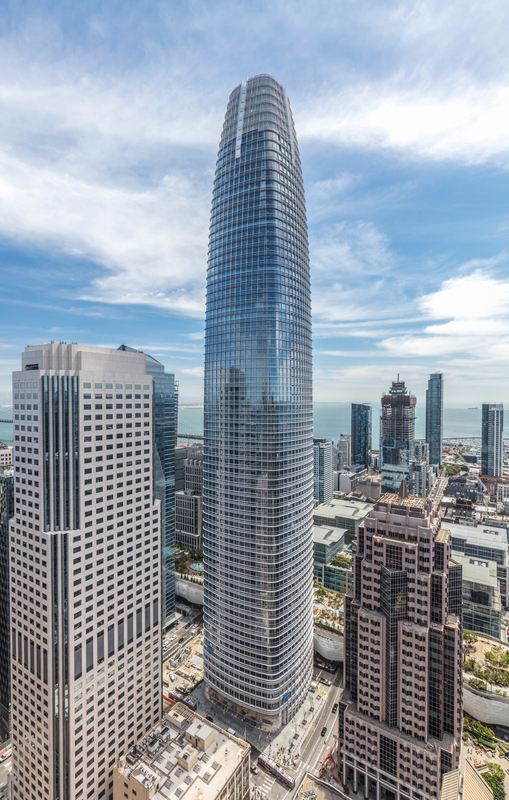 Salesforce Tower was one of 20 winners in individual height award categories, chosen from a total group of 65 award of Excellence Winners, receiving the award for Best Tall Building in the 300-399 meter category, and ultimately selected as 2019’s overall top project by an esteemed panel of judges. Salesforce Tower is a city-defining project, not only because of its impressive stature, standing 1,070 feet tall and boasting the highest occupied floor of any building in a seismic zone in the Western Hemisphere, but because of its significance as a beacon example of sustainability, for its occupant health considerations, and its seismic engineering innovations. The $1.2 billion, 61-story, 1.4-million-square-foot, LEEDv4 Platinum certified, Class A office project anchors San Francisco’s newly redeveloped Transbay District. It acts as a direct connection to the new transit center and its 5.4-acre rooftop park, providing the density needed for a successful, sustainable, transit-oriented mega-development. Externally, the tower is completely integrated with the surrounding urban environment, while internally the structure has reimagined the possibilities for a more health-conscious workspace, offering a more open and collaborative, column-free office; expansive windows for natural light; and floor-by-floor fresh air, making it one of the “healthiest” modern, high-rise buildings. Among the many innovative elements that make up Salesforce Tower, perhaps the most impressive is new structural system MKA created for the tower. As the structural engineer of record for the project, MKA designed a system that eliminates the need to use the exterior columns for anything other than carrying the weight of the floors to the foundation. The building uses a High-Performance Core that encloses all the elevators, emergency stairs, restrooms, and mechanical systems in high-strength concrete and creates an extremely strong structural spine. This eliminated the need for dense structure at the exterior window line and allowed for the use of only three columns on each side of the building to create panoramic views for occupants. Salesforce Tower is the tallest building in the world using only its central core to resist wind and earthquake forces, an impressive feat given the tower sits on complex soil strata and is located approximately 8 miles from the San Andreas Fault. The project was developed by Boston Properties and Hines with architecture by Pelli Clarke Pelli and Kendall/Heaton Associates. Construction was completed by a joint venture of Clark Construction and Hathaway Dinwiddie. Magnusson Klemencic Associates (MKA) provides structural and civil engineering services worldwide with $99 billion worth of projects in 48 states and 54 countries and individual projects in excess of $2 billion. The firm was founded 99 years ago and maintains offices in Seattle and Chicago, with a staff of 200, including 150 engineers and 30 BIM technicians.